If your limestone is dirty or dull-looking, scratched, etched, cracked, chipped, or otherwise damaged, don’t replace it! TECHSTONE can restore your limestone, not just making it look better, but making it look brand new again. We provide expert interior and exterior limestone services, for all kinds of properties, from homes, apartments, and condos to offices and other commercial properties, warehouses, retail stores, restaurants, hotels, and more. Whether you need minor services like having your limestone floors polished or major services like a complete limestone floor repair and restoration, we provide a full range of limestone care and maintenance services. Floor too dull or too shiny? Call TECHSTONE and specify the finish you need. If you have a new floor with some tiles that look more glossy than others – let TECHSTONE even out the finish for you. Whether you have or are seeking to acquire a gloss, semi-gloss or matte finish, TECHSTONE can deliver a beautifully restored limestone finish. Are your tiles uneven? Do you want your tile floor flattened to the grout lines to facilitate easier cleaning? TECHSTONE can grind away the excess stone to create a flat, level surface using state-of-the art diamond grinding technology. Once ground to the level and shape desired, the limestone is honed and polished to the finish you want. Does your limestone floor have dull areas associated with wear patterns, scratches, etches or spots? TECHSTONE can hone your limestone surfaces to eliminate these imperfections, resulting in a new limestone surface free of damage. With our limestone honing services, our expert technicians can achieve a honed or soft matte finish that is warm, inviting, and velvety smooth. 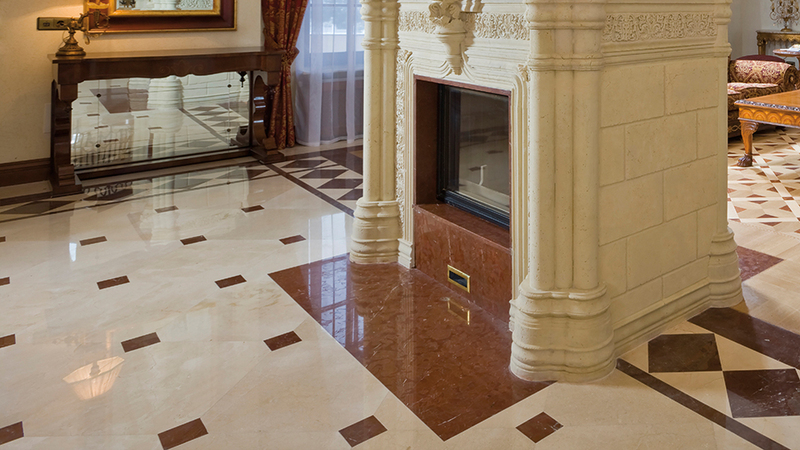 An uneven finish, dull spots or etches can diminish the elegant appearance of your limestone floors. TECHSTONE can polish your limestone using the appropriate diamonds or polishing powders to restore the finish you want, whether matte, semi-gloss or gloss finish. With our limestone polishing services, our expert technicians can achieve a beautiful, glass-like polish. Once your limestone floors, showers, tub surrounds, walls, and other limestone surfaces are restored, we highly recommend you have us seal your limestone to enhance its stain resistance. All stones (unless resinated) are naturally porous. If left unsealed, there’s always a risk of spilling a colored or reactive liquid, discoloring your stone. While most stains can be removed, limestone stain removal can be a time consuming, expensive and often frustrating process. Sealing represents an inexpensive, preventative measure against stain damage. Cleaning processes for limestone vary based on the surface condition and type of dirt or oil being removed. Limestone is easier to keep clean with periodic professional deep cleaning services, using non-acidic, highly-effective cleaning solutions. However, once wear sets in, creating hollows and low points for dirt to collect, your limestone can become difficult to keep clean again. TECHSTONE can assist you in not only cleaning your limestone surfaces, but in keeping your limestone properly polished, maintained, and free of scratches to help facilitate regular cleaning and care of your stone. TECHSTONE can remove limestone stains and limestone discolorations. Whether you are seeking guidance on how to do this yourself or want TECHSTONE to treat your limestone, the original finish of your limestone can be restored. Do you have chipped limestone tiles? Are there cracks in your limestone floor? What about broken limestone tiles? Before you replace your limestone, consider having TECHSTONE provide expert limestone repair services. TECHSTONE can blend the repair site with the surrounding area, honing and polishing it to match the finish on the rest of your limestone floor, countertop or other surface. Although it is rare for a limestone tile to be beyond repair, sometimes limestone tile replacement is necessary. TECHSTONE craftsman can, in many cases, remove your affected tile without damaging neighboring tiles, reinstall the new tile, level the installed tile with the surrounding are, and then match the finish as closely as possible. Unless you have an extra tile from the original lot to install, replacement tiles will likely be noticeably different. Even if you purchase the same tile by name from the same quarry, the quarry line has shifted and with that so has the color. Have no fear, our professional technicians have the knowledge, experience, and skills to get your limestone looking sharp again. An often-overlooked but critical part of your limestone floor or wall construction, grout lines must be in good shape before we can work with your stone. Whether your floor has sanded or non-sanded grout, TECHSTONE technicians can clean, restore, repair, and regrout as needed to restore a new appearance to limestone floor or wall. Regular cleaning and janitorial services are valuable for simple, day-to-day care of limestone floors. But over time, their processes leave floors with grout lines that just won’t come clean, shiny scratches, and increasingly obvious traffic patterns. As these problems develop, you become more and more dissatisfied with the appearance of the floors until it’s time for another round of professional restoration. With our regularly scheduled maintenance program, your floors can look great all the time, without the need for periodic restoration. For a free estimate on limestone floor polishing, cleaning and sealing, honing, stain removal, repair and other limestone restoration services, use our online contact form or call (888) 570-2859 today.